The Vulcan Corporation was founded in 1909 in Ohio as a manufacturer of wooden shoe lasts. The business really took off once they developed a new shoe last turning lathe. In 1919, Vulcan started a plant in Crandon, Wisconsin, which made “rough-turned”—or unfinished—lasts. The company chose Crandon because of the region’s ample supply of maple, the wood of choice for shoe last manufacturing. In 1925, the Crandon plant was moved to Antigo because of the region’s lumber industry and the better rail service there that made shipping much easier. In addition to shoe lasts, the company also began making heels for women’s high heeled shoes. Maple trees from within a 60-mile radius of Antigo provided Vulcan with the hardwood needed for shoe lasts and bowling pins, 1954. Photograph courtesy of the Langlade County Historical Society. By 1933, Vulcan had perfected their maple-drying practices and boasted numerous kilns and a large supply of maple to feed them. They expanded their product line to include rough bowling pins for the Brunswick Company that were shipped to Muskegon, Michigan, for finishing. During the 1940s, production at Vulcan in Antigo expanded to include golf clubs, furniture parts, sewing machine tops, and shuffle boards. During World War II they also made gun stocks. These secondary products were phased out in the 1950s when Vulcan decided to focus more on producing finished bowling pins to be sold directly to bowling alleys. By the late 1950s, 20% of all bowling alleys in the U.S. used Vulcan bowling pins. Wooden shoe last (unknown date) and bowling pin (late 1950s) manufactured by Vulcan. Photograph by Joe Hermolin. In 1954, some bowling-pin manufactures began experimenting with plastic coatings for their products. The advantage of coating pins grew with the increased use of automated pin setters, first introduce in 1946 but not in general use until 1952 when designs improved. These setters were hard on the pins resulting in grain or paint peeling from the pins. This in turn jammed the pin setter machines. Many companies experimented with solving the problem, but it was Vulcan that developed “Nyl-Tuf,” a coating that helped pins last longer and did not foul up the automated pin setters. Before going into widespread use, however, “Nyl-Tuf had to win approval from the American Bowling Congress, based in Milwaukee. This happened in 1959 and within 10 weeks Vulcan held a ceremony marking the production of its 50,000th pin coinciding with the 50th anniversary of the founding of the company in Ohio. Vulcan further improved its coating in 1960 when it began wrapping pins with a nylon sleeve in between coats of plastic. During the 1960s, Vulcan also began supplying the Japanese bowling boom with pins. 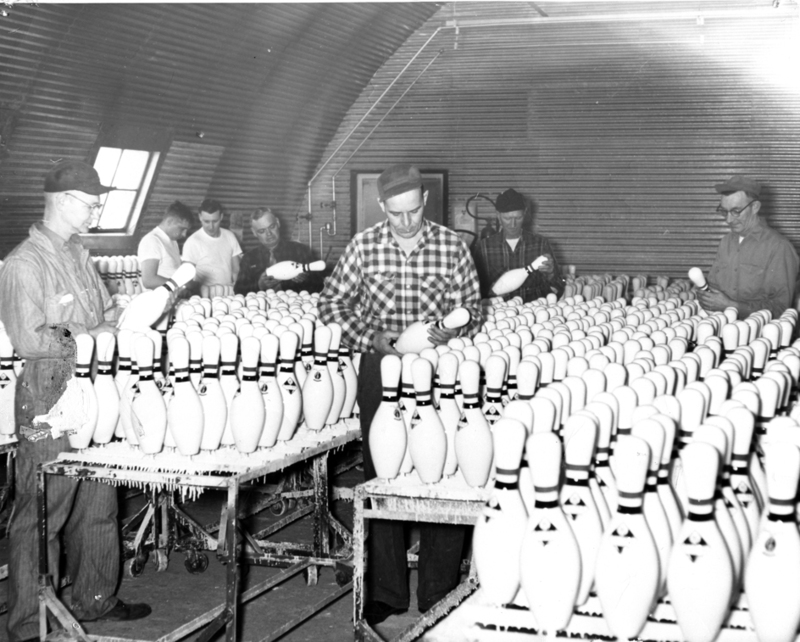 Ten weeks after gaining approval from the American Bowling Congress for their Nyl-Tuf coating procedure, Vulcan held a ceremony commemorating the production of its 50,000th pin, 1959. Photograph courtesy of the Langlade County Historical Society. Vulcan was not yet exclusively a bowling pin manufacturer by the time of its coating innovations. The company still made wooden shoe heels and shoe lasts, although demand was diminishing. Only in 1968 did Vulcan stop making shoe lasts and heels, devoting itself entirely to bowling pins. In 1990, Vulcan and Brunswick merged. While some factories closed, the Antigo plant expanded and continued to thrive. Vulcan continued to employ 145 people in Antigo, with a payroll of $3 million into the 21st century. Larry van Goethem, “Bowling Strikes with Wisconsin Maple,” The Timber Producer, May 1985, 38-41. “Massive Factory Leads Busy Building Season,” Antigo Daily Journal, November 20, 1990, 1. Featured image: Inspecting pins coming off the Vulcan assembly line, 1954. Photograph courtesy of the Langlade County Historical Society.